Snow makes birds disappear, if there’s enough of it. I brought the Nikon instead of the Benelli, and took way more shots. A contrast. Nice photos. 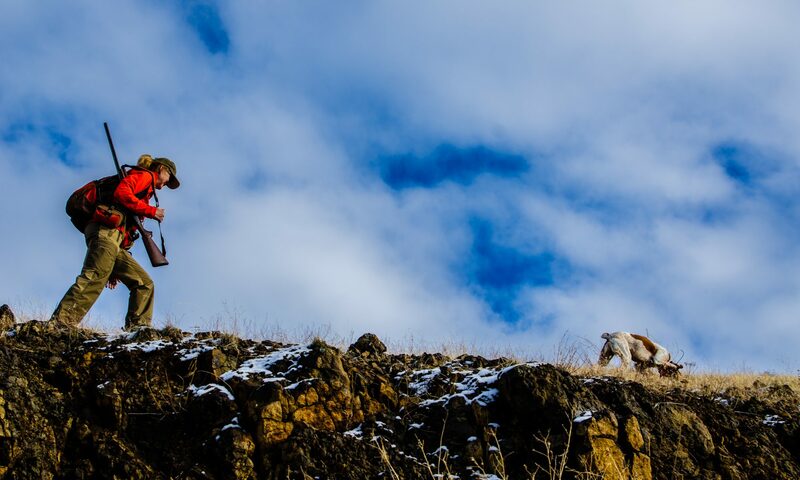 Something special about those snow hunts. You’re right, but it’s usually not the birds as much as the landscape, and this day was one of those. Hopefully Leslie’s friend takes good care of that Mother vest, a true classic. Great pics. I’ll let her know, Bill. Yeah, it’s a classic for sure. You got some beautiful shots. Wow! Thanks, April. Coming from you that means a lot. I thought I was keeping up but I don’t remember you adding a Shorthair to your string…or is that Leslie’s friends dog? Good eye, David: that’s our friend’s new pup! Bob, if you shot the Benelli as well as you shoot the Nikon, the birds wouldn’t have a chance! Gorgeous pictures Bob! Dan enjoyed seeing what he missed. Thanks, Gretchen. Next time we’ll find some galliformes. The snow made for some great photos. We just don’t need as much of it as 2016-17…….. Very true, Jay. Nervously awaiting the weather. This week was stellar, but cold. Not ready to start tying flies on weekends. Thank you, Alice! Stay tuned for more!